In this Sunday’s Gospel we hear about two of Christ’s miracles. 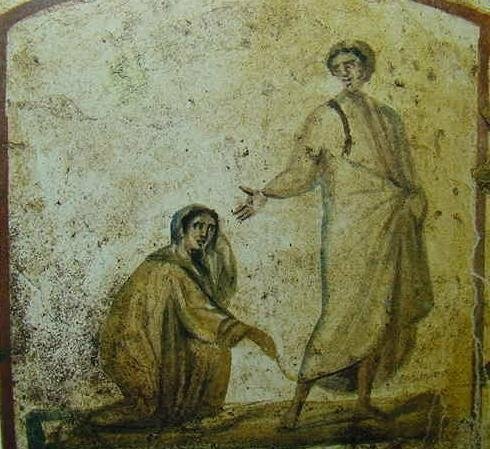 In the first a woman is healed of a twelve year sickness, and the second is the restoration of Jairus’ daughter to life. In these two events recounted by St Mark, one can see that some spiritual truth lies hidden in the reality of Jesus’ actions. It is easy to see in various parables that more than one spiritual interpretation is possible. However, it is not often so easy to see what is taught in Christ’s actions recorded in scripture. St Thomas teaches repeatedly in the Summa Theologiae, that everything that Jesus Christ did was for our salvation. Secondly, Vatican II (Dei Verbum 11) teaches that the truths of Sacred Scripture are recorded for our Salvation. Since the Holy Spirit has inspired the writers of Scripture, there is always something useful to be found, when someone reflects carefully on the text. In this Gospel, Jesus is first called to the aid of Jairus. Jairus is the head of the local synagogue and his daughter is dying. However, on the way to heal the little girl who is twelve years old, a woman who has suffered from an affliction for twelve years touches Jesus’ garments in faith and is healed. There was nothing that the woman could do to be healed from her affliction until she was healed by Jesus. In this miracle we can understand something about the mystery of salvation, and the relationship between God and man. St Paul’s teachings about justification and salvation are often misunderstood today. The fact that the woman could do nothing of herself to be healed from her illness is analogous to one half of St Paul’s teachings on Grace. It is a fact that people cannot heal their relationship with God by themselves. Sin has entered the world through one man, and nobody can heal the wounds caused by this sin by themselves. The other side of St Paul’s teaching is that this relationship can be healed and brought to new life. It is healed through the Grace of Jesus Christ, who was crucified for us on the cross. It is not this woman’s action which has healed her, rather it is the power of Jesus which does so. Jesus says to the woman that it is her faith that has made her well. So the spiritual message of this miracle is that faith leads to healing. This would seem to place some of the responsibility for the healing upon the actions of the woman. However, St Paul (Ephesians 2:8) offers an explanation that faith is a gift from God. Therefore, the woman’s faith in Jesus was the gift of the Father, for Jesus says elsewhere “no one can come to Me, unless it is granted him by the Father” (John 6:65). The second miracle is the restoration to life of the daughter of Jairus. Jesus addresses her as “little girl”, which in a beautiful way expresses love and affection for her. This little girl is brought back to life because of the faith of her father; Jairus. These two events belong together because the link between them is faith. However, the second miracle is a raising to life which is the result of faith. Therefore, this Sunday’s Gospel teaches us that faith heals us and raises us to life. What is this life, that we are being raised to by our faith? It is the divine life of Grace which will eventually flower completely in heaven, in such a way that it will be beyond our imagination. It is God Himself who comes to live in us. Let us try to remember the spiritual teaching of this Sunday’s Gospel as we anticipate the year of faith which Pope Benedict has declared will start this coming October, and may God strengthen the faith of all of us this year.